Three little words describe Howe Dyke Cottage perfectly. Home from home. This luxurious and characterful Lake District Holiday Cottage is sure to appeal to those looking for a luxurious holiday cottage surrounded by picturesque countryside. Setmurthy is surrounded by spellbinding scenery from glistening lakes and magnificent mountain views to pretty Lakeland towns. Howe Dyke is an ideal holiday cottage from which to explore the quiet and less frequented areas of the Lake District which include Bassenthwaite the Vale of Lorton, Buttermere, Loweswater and Crummock. There are an abundance of walking opportunities directly from the door and close by Setmurthy and Whinlatter Forests are home to a whole host of activities including Go-Ape tree top adventure, mountain biking and orienteering to name just a few. There is no wonder that once discovered holidaymakers choose to return to the area year after year. Howe Dyke Cottage has been lovingly restored maintaining many characterful and original features including an original exposed brick fireplace with wood burning stove and cast iron fire places. This is an ideal base for holidaymakers looking for a charming and luxurious home from home in an area awash with footpaths and countryside which are just waiting to be explored. •Open plan living accommodation. Cosy lounge with wood burning stove, TV, DVD player and a selection of books. 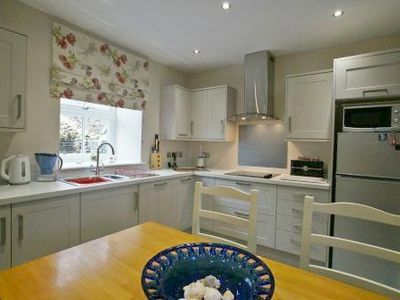 •Dining/kitchen with electric double oven, ceramic hob, microwave, dishwasher and fridge/freezer. •Cloakroom with WC and hand basin. •First floor: Double bedroom with TV, original feature fireplace and views over open countryside. •Twin bedroom with feature fireplace. •Luxurious family bathroom with shower over bath, WC, hand basin and heated towel rail. •All electric, bed linen and towels included. •Private parking for 2 cars. •Steps lead to a raised patio seating area to rear with outdoor furniture. •Sorry no cot or highchair available.